Christophe Bruno (born July 1, 1964) is a French artist. He began his artistic activity in 2001, influenced by the net.art movement. His thesis is that through the web, and especially through the ability to search and monitor it thoroughly by means of Google, we are heading towards a global text that among other things enables a new form of textual, semantic capitalism, which he explores in his work. His artworks include Iterature, Logo.Hallucination, The Google Adwords Happening and many other pieces. The Dadameter is an art project by French artist Christophe Bruno first presented in 2008. It was inspired by the work of french writer Raymond Roussel use of homophony described in How I Wrote Certain of My Books. It was co-produced by the Rencontres Paris-Berlin-Madrid 2008 for contemporary art and new cinema and programmed by Valeriu Lacatusu. The procedure provides three measurements for each couple of words corresponding to homophony (the Damerau-Levenshtein distance), Google Similarity (or semantic relatedness) and thirdly equivocation (to which extent a word has a univocal meaning or at the contrary is polysemic or equivocal). 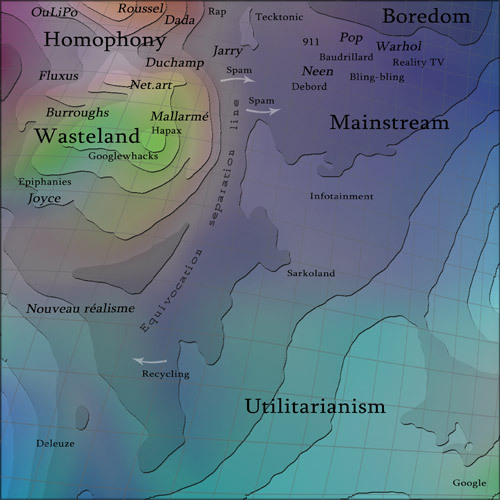 The Dadamap is a topographical map resembling an ocean floor, it features green for wasteland, light blue for utilitarianism, blue for mainstream, deep blue for boredom and brown for homophony. There is an equivocation separation line which roughly splits the map into two, or maybe that is a rift. From left to right, the map contains the following lemmata: OuLiPo, Roussel, Dada, rap, Tecktonik, 911, pop, Warhol, Fluxus, Duchamp, Jarry, Baudrillard, reality TV, spam, neen, bling-bling, net.art, Debord, Burroughs, Mallarmé, spam, Hapax, Googlewhacks, epiphanies, infotainment, Joyce, Nouveau Réalisme, Sarkoland, recycling, Deleuze and Google. This entry was posted in absurd, culture, Dada, theory on May 19, 2009 by jahsonic.